Ever since I was little, I loved collecting knick-knacks. LOVE THEM. I would buy them, or my mom would buy them for me, or I would get them as gifts. Cute little things to display on my desk. Things that prove no purpose whatsoever, but make me happy to display them and look at their dusty, little selves once in a while. I still love them. haha. 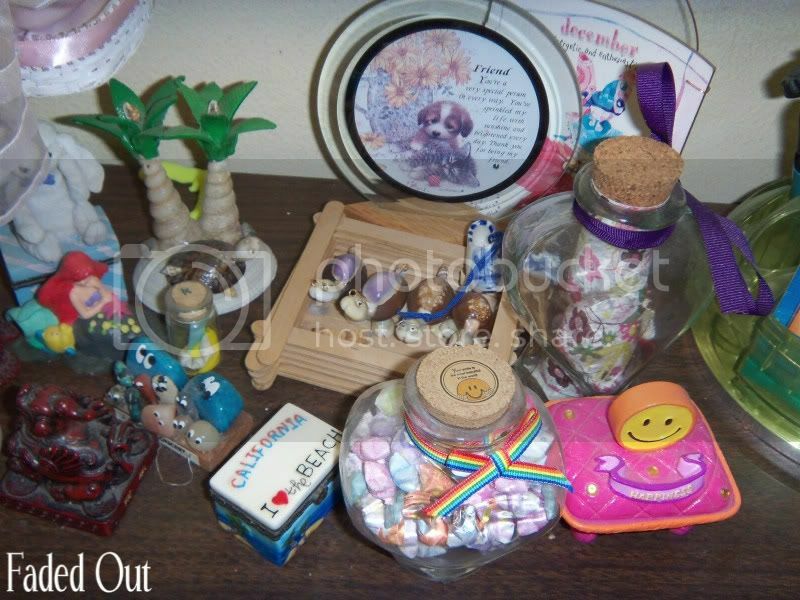 My desk used to be maybe 1/3 full of little doo-dads, but since I wanted to clear up a little more space on my desk and minimize the dust, I (painfully) decided which knack-knacks to retire and put away in a little box to keep (on my desk haha) or throw away. It’s still dusty in that area, but much more minimal now that I have less stuff. This is only one side of my desk, by the way. The other side has less knick-knacks and more things like tape, glue, photo frames, etc.